Taipei, Sept. 19 (CNA) Chinese American historian and Tang Prize laureate Yu Ying-shih on Friday praised Taiwan's democratic achievements and expressed the hope that Taiwan would not carelessly throw away its freedom. In China's thousands of years of history, Taiwan is the only democracy that has emerged, with its people able to elect their leaders every four years, Yu noted at a press conference after a speech in Taipei. "This is very precious. It is because of this that you (Taiwanese) are able to enjoy true human rights and rule of law," said the 84-year-old Princeton University emeritus professor, who won the first Tang Prize in Sinology. 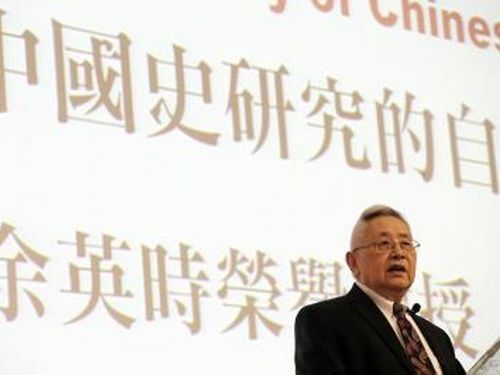 On Hong Kong's current fight for democracy, Yu said he believes the Chinese Communist Party would rather sacrifice its economy than compromise its authoritarian rule, and he believes the Chinese government was tolerant toward Hong Kong in the beginning because it wanted to convince Taiwanese that it would be alright to become " another Hong Kong". Yu, an outspoken critic of the Chinese government, cautioned Taiwanese against Chinese infiltration, saying China can even "buy your newspapers." He said he hopes the Taiwanese people will not "absentmindedly throw away" Taiwan's hard-earned freedom. Meanwhile, commenting on the proliferation of Confucius Institutes around the world that promote China's language and culture, Yu said Taiwan does not have to compete with China by establishing similar institutes. "You should be yourself," said the China-born scholar, who quoted a news report that alleged the Confucius Institutes are engaged in political and intelligence activities. Asked about his views on Taiwan's Sunflower Student Movement earlier this year, Yu said he approves of the student's opposition as Taiwan runs the real risk of being exploited by China on the service trade pact. He however stopped short of expressing full support for the demonstrations, saying that he is against violent protests in a democratic society because it is an undemocratic approach. He said protesters in a democratic society should try instead to bring about changes by convincing voters to vote differently in the next election.